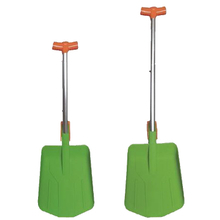 Shovel, Shovel Products, Shovel Manufacturers, Shovel Suppliers and Exporters - Dan Yang Three Win Industry Supply Co.,Ltd. Nylon blade and Aluminum shaft with light weight for easier portable and constant work lighter duty. PC T-handle design helps to work on higher efficiency. Different color projects for choice to meet different work environment demands. 1, Nylon blade and Aluminum shaft with light weight for easier portable and constant work lighter duty. 2, PC T-handle design helps to work on higher efficiency. 3, Different color projects for choice to meet different work environment demands. 5, Emergency sledge function designs. Aluminum blade and shaft with light weight for easier portable and constant work lighter duty. Telescopic shaft design for different working demands. 1, Aluminum blade and shaft with light weight for easier portable and constant work lighter duty. 4, Telescopic shaft design for different working demands. High quality nylon handle design helps to work on higher efficiency. 2, High quality nylon handle design helps to work on higher efficiency. 4, Emergency sledge function designs. 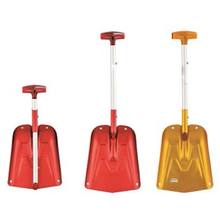 Ergonomically designed for speedy cleaning snow. Portable bag packed with truck and car mobile carrier. High quality nylon plastic handle with very light weight and comfortable feeling to user. Four sleet rivet connect the blade and handle tightness. 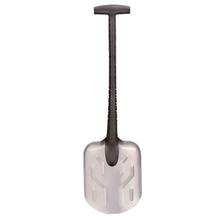 Aluminum alloy blade with three strength thread, make shovel lightweight and strong enough. 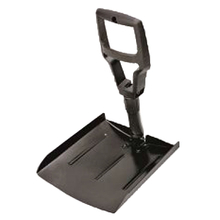 1, Ergonomically designed for speedy cleaning snow. 2, Portable bag packed with truck and car mobile carrier. 3, High quality nylon plastic handle with very light weight and comfortable feeling to user. 5, Four sleet rivet connect the blade and handle tightness. 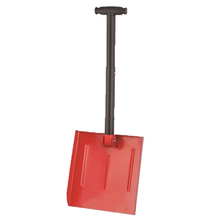 6, Aluminum alloy blade with three strength thread, make shovel lightweight and strong enough. 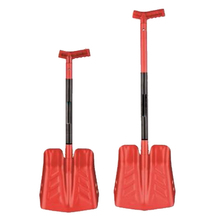 Two section Collapsible and Detachable design of blade and shaft for more convenient. Anodizing finishing surface treatment in small & portable design style. 4, Two section Collapsible and Detachable design of blade and shaft for more convenient. 6, Anodizing finishing surface treatment in small & portable design style. 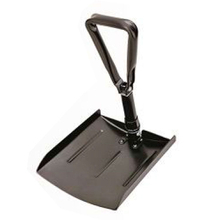 Dustpan function designed for more dust cleaning purposes. 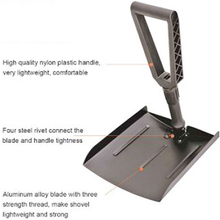 7, Dustpan function designed for more dust cleaning purposes.